(South Burlington)–A large crowd of attendees at Rights and Democracy’s VT Political Revolution Party this Thursday evening danced to musical acts including Dwight & Nicole, Myra Flynn, Chad Hollister, Craig Mitchell, The Wee Folkestra and Radio Underground to celebrate the launch of the Vermont Political Revolution Fund. This political action committee will serve as an electoral arm of Rights & Democracy, and will allow the organization to endorse and support candidates chosen by its leadership committee for state and local elections. 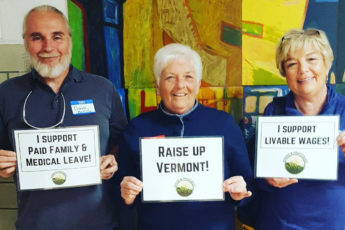 Joining the VT Political Revolution Party were special guest speakers Ben Cohen, Jerry Greenfield and Carina Driscoll (Bernie Sanders’ daughter). In between musical acts, Rights & Democracy staff, members, and leaders announced its preliminary endorsements for statewide and local offices. These endorsements included Matt Dunne for Governor and David Zuckerman for Lieutenant Governor.